This makes me think of the tiny clay vegetables I would make as a kid. I think I liked eating them just as much as the real thing. Next, Biff will tamper with the bug spray, and get WAX vegitables! So are you saying you liked clay or hated vegetables? 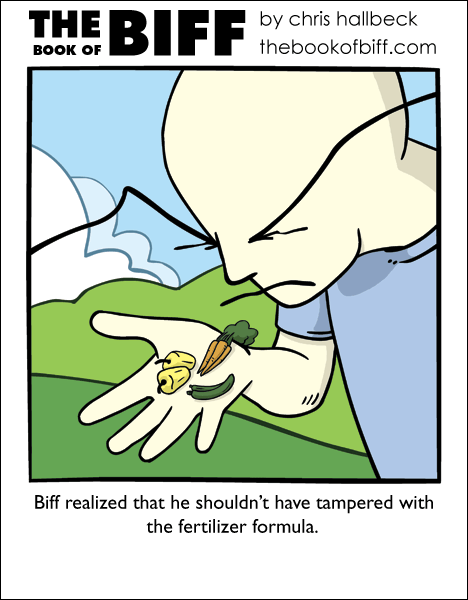 As for Biff: Will the fertilizer wear off, or will Biff be stuck at ten times normal size forever? BTW Torg, you read sluggy freelance too? lol – comic & comments. chris, it’s nice to have a steady source of amusement. Conversely you should check out some Chinese vegetables, there is one variety called a Winter Melon that you basically need a forklift to move around, it’s ridiculous. Well, we now know where those mini corn on the cob’s that the asians like to use in their food come from. Torg, you are my hero! You know…I hate tiny corn on the cob. I used to see it in various dishes when I was little and I tried it once, thinking it tasted like its bigger counterpart and I was horribly disappointed. @micah, I’m quite the opposite. I enjoy baby corn, but Corn on the cob is not my thing. I generally prefer creamed corn, baby corn, popcorn, or corn chips. but not just straight corn. I used to do the same thing with silly putty. I did have this Roseart clay that I used over and over again. I’d make little forest scenes or magical trees and leave the scenes all over the house and forbid my mother to mess with them. I don’t know why it was she never threw the clay out, even after I managed to leave nasty clay marks all over her glass tables. I see a prosperous business in itty bitty veggies! Biff could make some serious dough off of those! Wow…tiny vegetables…I have erasers that are shaped like them. Dey so cute. ^^ -want- He just needs to sell the fertilizer…I’d totally buy it. I’ve always loved tiny corn. I like the taste better (they seem to be less sweet that regular corn) and for some reason, the novelty of eating something at an odd scale never wears off for me.